Hey folks, were back today with fitness and martial arts expert Martin Rooney. If you jump back to part 3 of this expert interview series, you will learn what is the most important part of his training routine. Craig: How are you manipulating sets and reps and rest intervals in some of the body weight training? Do you start off with some of the most strength oriented body weight exercises, then you move away down to conditioning? How does one go from Hurricane Level One to Hurricane Level Five? Martin: Definitely on all of the categories and the changes, in our program there’s always constant evaluation taking place. One of the biggest challenges, and you bring it up right there, is think about it. What does everybody want to do? If you give them a choice, “Hey, do you want to do one or five?” everybody wants to get hit over the head and they feel that the ultimate goal of a session is to be completely wiped out and dead on the floor, so everybody wants the five. You as a coach, this is where the art of training comes in. You have to evaluate, you have to see what people are prepared for, and you have to give them challenges that are a little harder than what they’re prepared for, but not so hard that now you’ve either injured them or you’ve made it where they don’t want to come back. How I would answer that is I have a number of standards that we use in our system according to different body weight numbers. These are in all the Warrior Challenges that we do. According to how the people score on that as well as their mobility and their cardiac capacity, that will help me to discover and choose which level those people go to. That’s what makes the Hurricane system really cool is that you’re able to undulate or move forward and backward just like a strength training session with the intensity of your metabolic session, where today unfortunately how I see metabolic training is everything is 100%. Monday you do 100%, then Tuesday you just change up the stuff and you do 100%, Wednesday you do 100%. One, you’re not going to be able to maintain that forever, and two, eventually a person is going to say to themselves, “What am I doing this for anymore? What is the goal or the purpose?” Or, they’re just going to chase something else that’s shiny and new. I’m really trying to dig deeper into this style and eventually, ultimately create the rule book that people will be able to follow just like if they were to think about reps and sets in a weight lifting session or rest periods there. I don’t think anybody has really tried to either identify or pioneer those areas in the metabolic aspect. Craig: That’s a really good way of putting things. Let’s talk about the challenges that you come up with. You had some really cool challenges in Men’s Health magazine. The first one I saw was a three minute push-up challenge, then recently you did a four minute push-up challenge. Maybe that was on T Nation. Why don’t you tell our readers about those first and how they should do them properly because most people screw it up and go to fatigue on the first round. What are some other really good exercises that maybe you haven’t mentioned in your articles that also work really well for these challenges? I’d love to know. Martin: The challenges started a long time ago where, like I said, I was trying to find evaluative ways that I could assess where people were and rank and score them. You’re absolutely right. We do a three minute challenge for push-ups, we do a four minute challenge for push-ups, we also do a one and a two. Over the years of testing thousands of athletes, I created a scoring table on how people could score on that. In my second book, called Ultimate Warrior Workouts, all of these challenges are featured. All the ones you just mentioned and like, “Hey, what else do you do?” We have a push-up challenge in there, there’s a chin-up challenge in there, there’s a dip challenge in there, there is a sit-up challenge, a sit-out challenge, and there’s even how much can you do according to your body weight on bench press and dead lift and squat. All of these challenges when you put them all together, you can create a ranking to kind of see where a person is. Why I like the challenges is I’ve never had anybody get hurt during one, and it’s a great assessment tool and a motivational tool. We use these weekly in the Training for Warriors system. Now we’re coming up on 50 facilities that have the Training for Warriors license, and every week we’re testing among the 50 to see who the grand champions are and what’s going on. This is the important part – the people are really competing against themselves, not against anyone else. Where some of the other systems out there, it’s all about this crazy test or two that’s been invented that’s really probably too much for certain people, and then they’re all trying it and people get hurt and in the end, people don’t feel so good about themselves. These tests, you’re working against your score and always trying to improve on that. I’ve tried to set the time limits and the exercises so that nobody gets hurt. I’ve definitely thought them through, but I would recommend if anyone wants to check out on T Nation the latest one that I did on the four minute push-up, I have tons of videos on it, too. All the challenges are featured in videos on my YouTube channel, as well. You can see famous guys like Frankie Edgar and I have Olympic trials winners and different people doing the tests. It’s really fun to watch and see what they’re doing and how they score, and then try to compete against them. Craig: What is your YouTube channel? It should be quite famous because you have so much amazing stuff on there. Martin: There are over 250 videos and if you go to TFWarriors1. If anybody wants to just type my name in, you’ll see it come up and you just click the little link, TFWarriors1. It will take you to the channel. There are coming up on three million views and I want to estimate there are probably about 100 hours of content between all those videos. There’s motivational stuff, but there’s loads of pretty amazing stuff that either I’m doing or other people are doing on there that will give people great ideas, whether it’s a strength training standpoint or a metabolic standpoint. I would recommend that for anybody. Even go back, too, because some of the older stuff is the best stuff, and sometimes people will find a video from years ago and say, “Oh my God, I never saw that.” There’s just really, really good stuff on there. I obviously can’t recommend it enough. Cool! Lets end this for now but make sure to join us in part 5, where Martin give some recommendations on different training sessions. 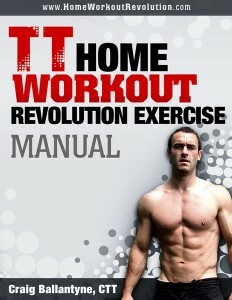 If you haven’t yet check out the NEW Home Workout Revolution System.